We're doing a blog series on things that can take your business to the next level. Things that are crucial for you to go from amateur to money-making professional. Which is why we created the October 26, 2013 Next Level Business Workshop as a day where you can make these tweaks happen. This post by co-founder KC talks about one of the biggest ways to help people understand what you make at a craft or trade show... signage! Signs are the first indicator of who you are and what you are doing at a show. While it helps customers find you it also establishes your brand and what you are selling amongst all the sellers surrounding you. As Sharon and I have visited lots of shows on our own time and for the Academy, we feel like strategically mapped out signage can impact your bottom line and aid in customer experience. It is a passive task that helps with communicating key ideas so different people make up their mind about purchasing from you. Here are some of our tips and examples for making sure your signs work for you. Can you see the name of your company from around 25 feet away from your booth? It's hugely important to be seen, especially by people who are your fans and are seeking out your booth. Vendors often forget how hard it is for customers to see their booths' through the mobs of people at a craft show, who are blocking the view of your booth. Are you prepared for weather? Even those of us in Southern California need to be prepared for high winds and the potential rain storm when choosing both the signs as well as the method of displaying the sign. A good suggestion would be to have some sort of backup display method planned. Don't hide your sign in a cave. If your sign is tucked away in the back recesses of your tent customers will walk past and be less likely to shop from you. When customers walk past and can't get a good feel of what you are selling inside they often won't come in to find out. Your sign should be a call-to-action! It’s the first impression that engages your customer. Clear up confusion. If there is something you feel like is always a talking point when customers approach it could be beneficial to have a sign conveying that message. Get a second pair of eyes. Have someone look around at your products and display beforehand to make sure all the info a customer needs to decide and purchase are available and spelled out. For instance: What is it? How much is it? Where are you located? Do you hand make it? Is there a special? How do you use it? How can we find you / contact you? Do you have anything special on your blog/ Newsletter/ FB/ Twitter? For the holidays do you gift wrap? Do you have a social media promotion? Like a take a picture #specialhashtag raffle? Awesome press people should see? Was a celebrity photographed wearing your jewelry? Win an award for best pie? Are you known for something? Only one one that does what you do? 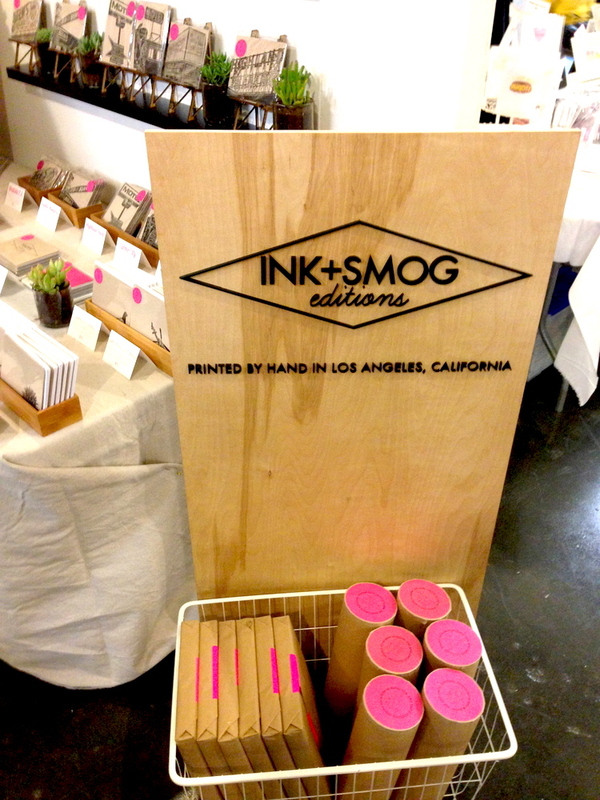 We were loving the Ink+Smog booth design at Artisanal LA. Their name is big and in multiple locations so there is no doubt who the seller is. Makes it easy if you want to check their stuff out after the show... you'll remember the name much more easily! The Simple Goods Supply, makers of candles had a great booth at Renegade that made sense with its aesthetic and had multiple points of signage so you were sure to not miss who it was that was selling these great candles!